If you are seeking a tour that suits the needs of your family, Egypt Travel offers you an exciting Family Tour in Egypt that takes you to Cairo, Aswan, Kom Ombo, Edfu and Luxor. Enjoy sailing on board a Nile Cruise in the charming Nile River . After your breakfast you will be accompanied by your personal guide to Giza Plateau to visit one of the seven wonders of the ancient world, the Great Pyramids of Cheops, Chefren and Mykerinus, famous Sphinx , varying between six-thousand and even thirteen-thousand years old ,and Valley temple facing the great statue. Lunch at good quality local restaurant. Then transfer to enjoy the Egyptian Museum, Treasures room for the child king Tutankhamen. Continue to Coptic Cairo to visit the Hanging Church and Ben Ezra Synagogue. Combining fascinating history with shopping in a lively Khan El Khalili Bazaar, this dates back to 1382. Later, you will be transferred to Giza railway station to board the sleeper train to Aswan-dinner will be served on board. Overnight inside your compartment. You will be met & assisted at Aswan station by our representative, embark your Nile River Cruise, before lunch time , then enjoy visiting the world famous High Dam, The awesome Philae temple, which is devoted to the two goddesses Isis and Hathor, and the largest known ancient obelisk, located in the northern region of the stone quarries of ancient Egypt, the Unfinished Obelisk. Dinner on board and overnight in Aswan. Sail to Luxor, have breakfast on board then Visit the West Bank, take an excursion to the royal cemetery for 62 Pharaohs, Valley of the Kings, then to mortuary Temple of Queen Hatshepsut, which was built by the architects of the New Kingdom Pharaoh Hatshepsut in the 15th century BC , at El-Deir El-Bahari & the Colossi of Memnon. Lunch on board. Enjoy afternoon tea during sailing. Dinner on board Overnight in Luxor. 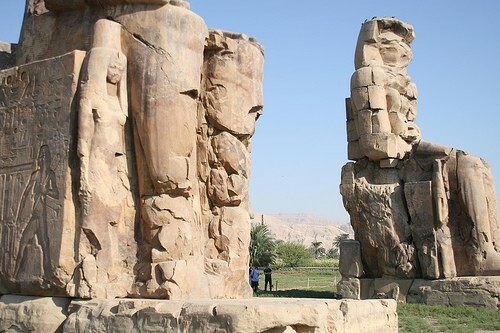 Breakfast aboard cruise before disembarkation and then you will be accompanied by your guide to visit Karnak & Luxor temples at the East Bank of the River Nile and later you will be transferred to Luxor railway station to board the sleeper train back to Cairo. Have your dinner and overnight on board sleeper train in your private compartment ( twin beds) . Sleeper train from Luxor to Cairo is about 11 hours. Breakfast aboard the train before arriving Giza train station, Egypt Travel representative will meet and assist you and transfer you to the hotel for free time at lesiure and check into your room. Optional tour in Cairo to visit Step Pyramid of King Zoser at Sakkarra, and the Alapaster statue of King Ramses II at Memphis "the ancient capital of Egypt" Overnight stay in Cairo. Accommodation in Cairo for 02 nights at including bed and breakfast.